In some of the countries, common name of this herb is puncture vine as spikes on its fruit pierces tyres of bicycles, interestingly some of the city councils used to pay people who collected fruits of this herb so that puncturing of bicycles could be prevented. Other names for this herb are devil's thorn and goats head etc. One of the common name for this plant in India is Hast Chinghar where Hast means Elephant and Chinghar means loud cry as when spikes of this fruits pierces soft soles of elephant, he cries. 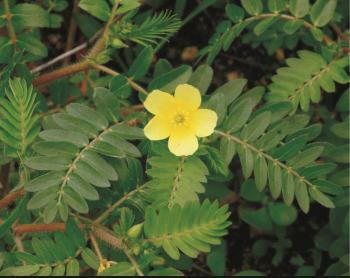 Tribulus Terrestris species of this plant is herbarius, annual, prostrate or erect, diffusely branched with small rough dull green coloured leaves. It bears light yellow coloured flower. Shape of fruit of this herb is like goat's head with sharp spikes. Roots and fruit of this herb are used as medicine in Ayurvedic and Chinese systems of medicine. In Ayurveda, the Indian traditional medical system, this herb is included in category Laghu Panch Mool, a sanskrit language word, where Laghu means small, Panch means five and Mool means roots, so this herb is part of group of five herbs which have similar properties and their roots are used as medicine. This herb works as diuretic, oedema reducing, coolant on urinary system, lithotriptic crusher, bladder cleansing, improves sexual drive in men and women. Regarding classical Ayurvedic properties or energetic of this herb, its taste is sweet hence vata and pitta pacifying, potency is cooling, unctuous in nature and heavy to digest. Chemical and pharmacological studies of this plant reveal presence of phytochemicals (phyto means plant in origin) like saponins, flavonoids, glycosides, alkaloids and tanins in it with multiple health benefits. Detailed health benefits of this herb can be studied under following headings. Basic quality of this herb in Ayurveda has been described as diuretic i.e. it increases urine output. Urination is a natural physiological activity of the man to eliminate toxins from the body. Due to various reasons, there is decrease in urine output resulting into fluids and toxins retention, swelling or oedema and weight gain. In such situations, use of this herb is very useful. Most of the diuretic medicines excrete out an important element 'potassium' also from body for which person has to take additional potassium, but this herb is potassium sparing diuretic and does not deplete potassium reserves of the body. Because of various reasons there is stones formation in kidneys and bladder which may effect kidneys and bladder This herb is a good lithotriptic in action means it crushes stones of kidney and bladder and diuretic property of this herb expels them out . Ayurveda has included this herb in the category of vajikaran and varishya, a sanskrit language term which means Aphrodisiac and is widely used in conditions of erectile dysfunction, libido and low performance because of its action on central nervous system. Ayurvedic physicians use it to improve low sperm count affecting fertility. In Bulgaria also, this plant is being used as folk medicine for impotence. Scientists have observed in laboratory animals that this herb is useful for preventing and managing heart attack & preventing formation of clot or thrombosis, improving the function of heart after the heart attack or myocardial infarction. It is also useful in managing high blood pressure, a common life style disease which is also responsible for some of the heart diseases. Unhealthy foods like excessive saturated fats, dairy products, poultry along with unhealthy life style like not following natural bio clock, late night sleeping, sedentary living, stressful and hectic routines adversely effects production of high levels of cholesterol in our body which produce many life threatening diseases. It has been scientifically proved that use of herb Gokshru brings down high cholesterol levels. Role of this herb in reducing blood sugar levels in laboratory animals has been widely reported by scientists. Ayurvedic physicians also use dry fruit powder of this herb for diabetes. It also prevents adverse effect of diabetes on kidneys, heart and nervous system. Bacteria and Fungi are responsible for many infectious disease for which antibiotic medicines are used. Scientific research has proved antibiotic and antifungal role of this herb, so there is great prospective of use of this herb as a safe herbal antibiotic. Use of excessive fats, sugars, carbohydrates, presence of preservatives, flavouring agents, food colouring agents etc. in food have adverse effect on liver and hamper its function of metabolism. Gokshru or Terrestris herb is natural gift to man which protects liver from adverse effects of chemicals and unhealthy food. Incidence of cancer is increasing fast and we have not been able to find a good solution to cure or prevent this disease satisfactorily. Scientists move a step forward in managing this disease and disease moves five steps forward and cancer is still potential killer disease. It has been observed by researchers that this herb is quite useful in some of the breast and liver cancers. Pain and inflammation are associated with most of the diseases, rather inflammation is first step for development of many life style and other diseases. In order to get relief from pain and inflammation anti inflammatory and analgesic or painkiller drugs are widely used as over the counter or prescription medicines all over the world. Such drugs have hazardous side effect like causing gastric ulcers or damaging kidneys. This herb is a safe anti-inflammatory and pain killer without undesirable side effects. Few more health benefit like useful in improving immunity, killing intestinal worms, relieving anxiety and depression have been reported. For health benefits fruit and roots of this herb are used in Indian traditional medicine Ayurveda and traditional Chinese medicine. In Ayurveda, for curative purpose recommended dose of dried fruit is 5 grams , dry roots powder is 20 grams in the form of decoction. Decoction of 20 grams whole dry plant is also used by some of consultants. For prophylactic purpose, smaller doses are recommended. But it is always recommended that personal consultation of qualified Ayurvedic consultant or an herbalist should be taken. We find that mother nature has lot of herbs in its lap & we just need to have right information about herbs. Lot of money of tax payers is being spent for research in modern pharma industry. Let governments acknowledge use of herbal and traditional medicine for health care of humanity. Gokshru is an important herb with great health benefits and is widely used in Ayurveda and Chinese system of medicine. This herb is potassium sparing diuretic and does not deplete potassium reserves of the body. Gokshuru herb is a safe anti-inflammatory and pain killer without undesirable side effects.